Frederick Douglass stood at the podium, trembling with nervousness. Before him sat abolitionists who had traveled to the Massachusetts island of Nantucket. Only 23 years old, Douglass overcame his nervousness and gave a stirring, eloquent speech about his life as a slave. Douglass would continue to give speeches for the rest of his life and would become a leading spokesperson for the abolition of slavery and for racial equality. 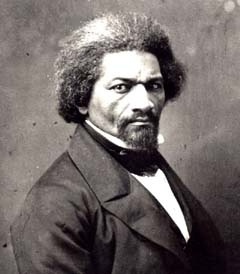 On January 1, 1836, Douglass made a resolution that he would be free by the end of the year. He planned an escape. But early in April, he was jailed after his plan was discovered. Two years later, while living in Baltimore and working at a shipyard, Douglass would finally realize his dream: he fled the city on September 3, 1838. Travelling by train, then steamboat, then train, he arrived in New York City the following day. Several weeks later, he had settled in New Bedford, Massachusetts, living with his newlywed bride (whom he met in Baltimore and married in New York) under his new name, Frederick Douglass. In 1845, despite apprehensions that the information might endanger his freedom, Douglass published his autobiography, Narrative of the Life of Frederick Douglass, an American Slave, Written By Himself. Three years later, after a speaking tour of England, Ireland, and Scotland, Douglass published the first issue of the North Star, a four-page weekly, out of Rochester, New York. Ever since he first met Garrison in 1841, the white abolitionist leader had been Douglass' mentor. But the views of Garrison and Douglass ultimately diverged. Garrison represented the radical end of the abolitionist spectrum. He denounced churches, political parties, even voting. He believed in the dissolution of the Union. He also believed that the U.S. Constitution was a pro-slavery document. After his tour of Europe and the establishment of his paper, Douglass' views began to change; he was becoming more of an independent thinker, more pragmatic. In 1851, Douglass announced at a meeting in Syracuse, New York, that he did not assume the Constitution was a pro-slavery document, and that it could even "be wielded in behalf of emancipation," especially where the federal government had exclusive jurisdiction. Douglass also did not advocate the dissolution of the Union, since it would isolate slaves in the South. This led to a bitter dispute between Garrison and Douglass that, despite the efforts of others such as Harriet Beecher Stowe to reconcile the two, would last into the Civil War. Frederick Douglass would continue his active involvement to better the lives of African Americans. He conferred with Abraham Lincoln during the Civil War and recruited northern blacks for the Union Army. After the War, he fought for the rights of women and African Americans alike. "He [Frederick Douglass] is an African American hero... he is an American hero." His autobiographical narratives stunned the world, and have shocked, moved, and inspired readers ever since. Here, complete for the first time in one authoritative volume, are the three powerful and gripping stories, now recognized as classics of American writing. Fascinating firsthand accounts of slavery and abolitionism, John Brown and Abraham Lincoln, Civil War, Reconstruction, and the emerging struggle for civil rights, they are above all the inspiring story of a self-made American: a slave who became adviser to the President, minister to Haiti, and the most influential black American of the nineteenth century. Our Frederick Douglass Homepage discusses the following: Abolitionist Frederick Douglass and the Antislavery Movement History, Abolitionist Leader Frederick Douglass Accomplishments, Achievements, and Final Results.